POSTED BY ADMIN ON 05-Dec-2018. Blockchain is one of the most sought-after technologies as of today and is on the verge of going mainstream in every industry. Over the years, there has been a humongous growth in the worldwide Blockchain market and it doesn’t seem to stop just yet. The global Blockchain technology market is expected to reach $2 billion by the year 2022 at an annual growth rate of 51% since 2016. Whether or not, the association with Bitcoin and cryptocurrencies had little to do with the devaluation of this state-of-the-art distributed ledger technology. 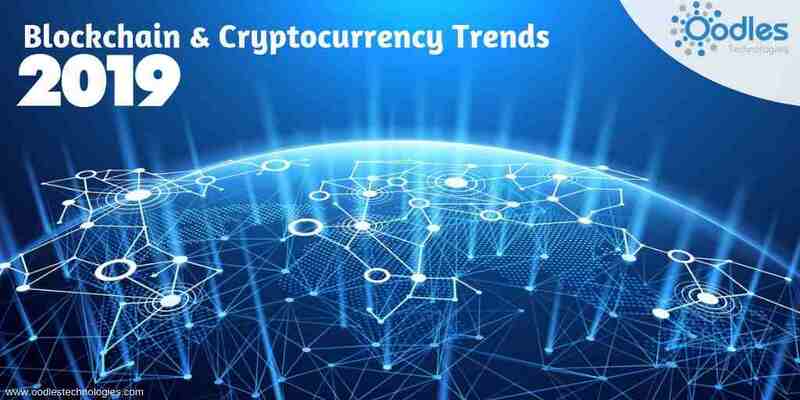 On contrary, the use cases of Blockchain have multiplied even after the devaluation of cryptocurrencies and people are now more confident about implementing this in their business processes. In this blog, we bring you the five technological trends that will dominate the market in 2019. Tokenization of security entities in different industries like finance, banking, and real-estate will proliferate next year with a focus on cryptocurrencies and Blockchain technology. As a matter of fact, security tokens are largely being used for backing up the real assets of a company in various industries which in turn provides greater liquidity to the company’s stakeholders. Tokenization of assets brings a number of benefits to the organization and its stakeholders. For example, buying and selling procedures can be made simple and uncomplicated. Let’s say there’s some person who wants to sell his car. As usual, he’ll have to go through a cumbersome procedure in order to transfer his ownership to the buying party. Contrary, if the car has been tokenized i.e backed by a digital token, then he’ll just have to sell the token to the intended buyer and the ownership will be transferred. It’s that simple. Decentralized apps or DAPPs are creating quite a stir these days. The advent of Blockchain technology had much to do with the decentralization of entities and decentralized apps are one of the many use cases of Blockchain. Although it’s quite challenging to scale a network like Blockchain, platforms like Ethereum have made it possible to build seamless decentralized apps powered by state-of-the-art ledger technology. So now that we have Ethereum Casper to the rescue, it will help us move past the pain points of DAPP development and the following year is expected to witness a massive upsurge of mass interest in Decentralized Apps. Just like the decentralized apps that are built on top of the Blockchain protocol, the gaming companies can also leverage the features of Blockchain, especially for in-app purchases. Games built on Blockchain can use digital tokens as in-game currency. Many gaming companies are making use of Blockchain service to curb the piracy persisting in the gaming community. To crackdown piracy, they are building a decentralized marketplace where games can be sold and purchased with cryptocurrencies. In 2019, we might see a substantial rise in adoption of Blockchain across the gaming communities.